Synopsis: The journey continues, as Pilgrim’s wife, Christiana, disregards the ridicule of her neighbors and follows in her husband’s footsteps toward the Celestial City. Accompanied by her four sons and Mercy, a young neighbor, Christiana is in for an adventure. Travel with them as they gather wisdom and confront internal and external dangers along their path of faith. They meet up with Great Heart, a noble warrior with the Sword of the Spirit, as he defeats the deceitful Giant, Grim, and his pair of fierce lions. The insight of the Interpreter comforts them when he explains that God sees not the faults of the sinner, but the perfect likeness of His Son, in whom the pilgrims believe. Travel with Christiana and her little troupe as they encounter Vanity Fair, the Enchanted Forest, and the Great Chasm, experiencing perils and triumphs on their quest of faith for the Celestial City. If you are worried that The New Amplified Pilgrim’s Progress Part 2 (Christiana) might be a carbon copy of The New Amplified Pilgrim’s Progress, you needn’t fear. Though Christiana (Christian’s wife) and her children follow the same, narrow pathway toward the kingdom, their experiences are far from the same as Christian’s. They do indeed cover some of the same ground and meet a few of the same people and obstacles, but they meet them in different ways, and also meet many new and different challenges. I would have to say, though, that this book can stand alone but has far more impact if you read it after reading Pilgrim’s Progress. One of the things I loved about this book is that it really gets you to thinking about the object lessons all around you. Of course, the book itself is an allegory, and almost every character in it and obstacles they overcome is an object lesson in an of itself. Yet, within the storyline of the allegory, the traveling pilgrim band learns to see object lessons everywhere, even in the common and mundane scenes and events of life. After reading in the book, I would go back to my everyday duties looking for those same sorts of object lessons. And I, too, would realize that they are everywhere, to be found in almost every aspect of our lives. Little “pictures” that God has put there to turn our thoughts toward Him throughout the day, if we train our eyes to see them. Another beautiful lesson that really impacted me from this book was that not all pilgrims have to be strong and bold to make it to the kingdom. There are those pilgrims who are weak and faltering, but who are pilgrims heading for the kingdom nonetheless. God has a special place in His heart for these childlike ones. Amidst the stories in Pilgrim’s Progress and Christiana filled with heroes like Christian, Faithful, Hopeful, Christiana, Matthew, Mercy, and Great-Heart, it would be easy to get the impression that to be a pilgrim, one must be as bold and brave as a lion. When you first begin reading, you might begin feeling discouraged because you are one of those Christians who fights against fears, anxieties, and uncertainty. That’s where this book will offer your the most hope and encouragement if you just keep reading. You will meet Miss Fearing and Ready-to-Halt and Mr. Feeble Mind. And you will learn that sometimes those who are weakest in outward strength are strongest in inward qualities. Not only that, but the Lord has made ample provision for whomever wills to enter the kingdom of heaven. No temptation or trial is ever too much for you to bear. Those of you on the other side of the spectrum who find it easier to be courageous and strong will learn to take care that you do not judge the weaker pilgrims. Though Mr. Feeble Mind was slow to understand the deep theological discussions his companions held, he never for a minute would have harbored even the thought of turning back when facing difficulty, as some of the others would. So, whether strong in faith and virtue, or weak and childlike in spirit, you can rest assured that our merciful Lord will pave your path in accordance with your infirmities. There were other lessons that stood out to me from this book. One is the power of prayer. While The New Amplified Pilgrim’s Progress emphasized the power of God’s Word, this book expounds on that by adding the power of storming the gates of heaven in prayer. Another point this book made was that when we are victorious as Christians, we can make the way easier for those who follow after us. This Christiana and her band did time and time again, and they also found parts of their path easier by learning from the mistakes of Christian and his companion who went before them. 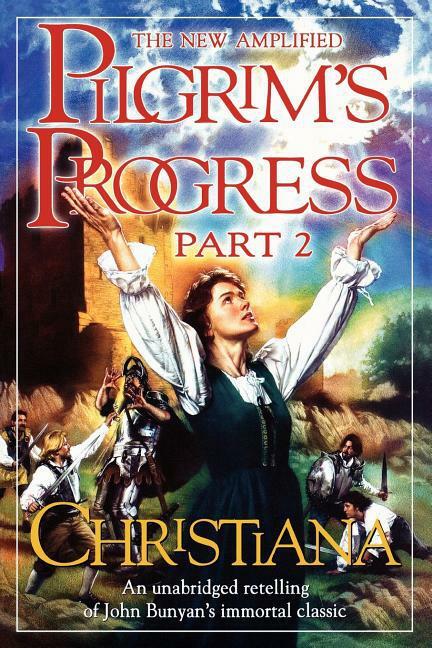 Your life will be touched and your faith grown through these and many other lessons when you read Pilgrim’s Progress Part 2 (Christiana).